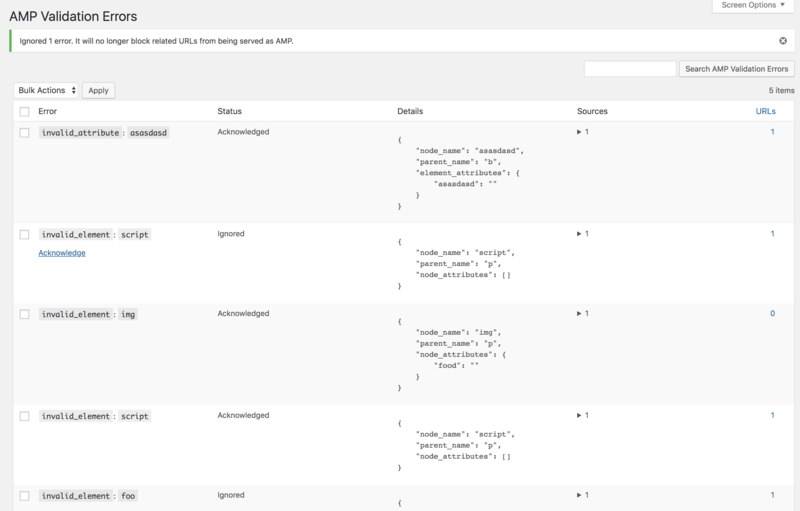 This will include the plumbing to be able to achieve dynamically allowing AMP responses based on validation status (#1087). It should include the ability to acknowledge a certain validation error as being ignored (#1003, #1063). Add “term statuses” (via term_group) for acknowledged and ignored, with ability for user to change them. 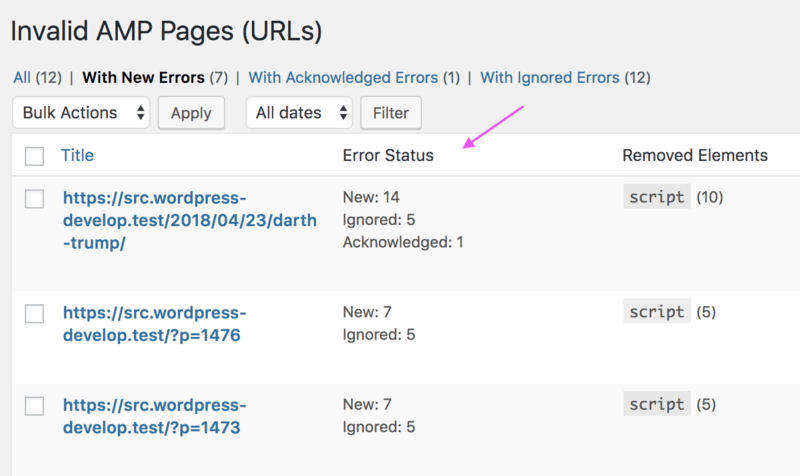 Add ability to acknowledge/ignore errors from the Invalid URL post edit screen. Move sources to be stored in the amp_invalid_url posts themselves. This addresses issue with validation errors having dynamic sources, such as post_id. Capture inline script contents in validation errors. Fixes #1031. Merge enqueued_script validation error into removed_element validation error, combining sources into latter. Detect when critical validation errors are present after post-processor runs, and refresh with non-AMP version. Refactor prototype code into better-organized class(es). 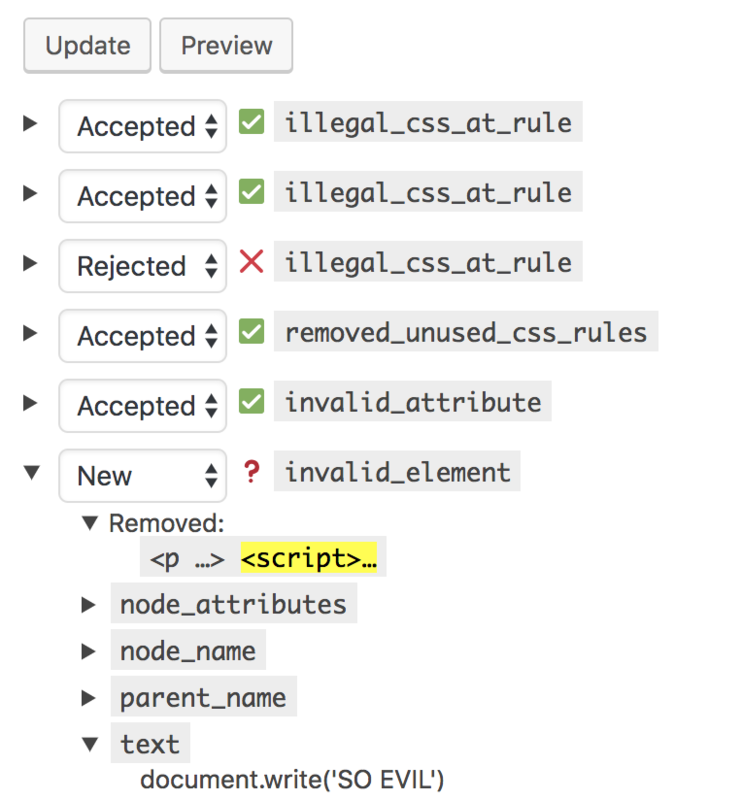 Accepted validation errors for CSS need to be applied when pulling parsed CSS from cache. 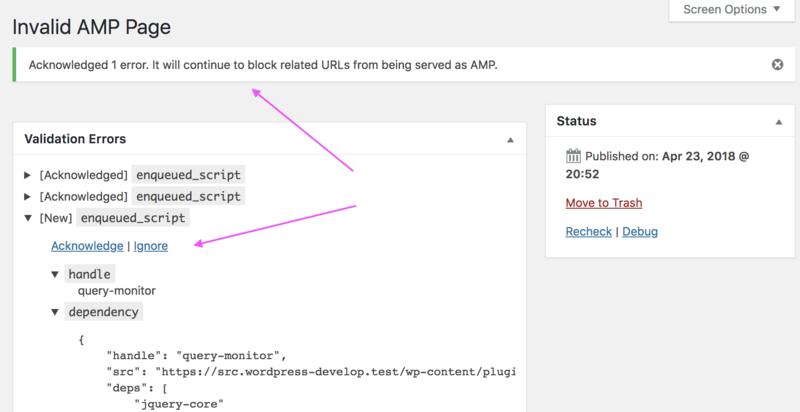 When serving dirty AMP, ensure document.write is disabled for sake of amp-live-list. 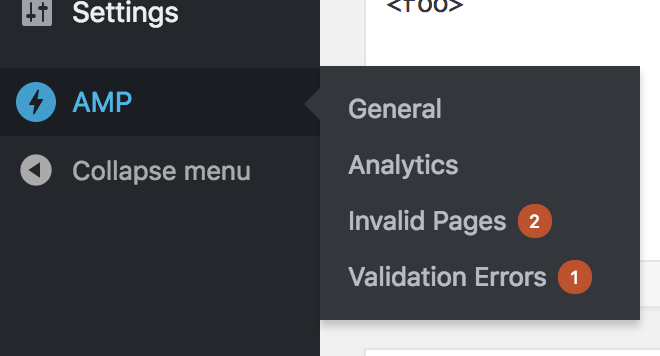 Likewise, the number appearing with the “Invalid Pages” admin menu item also is now the number of invalid URLs which contain at least one new validation error. Next step here is to allow a user to switch the status of a given validation error inline when looking at the list of validation errors for a given invalid URL. It would be good to have a way to go back to the "blocking status". So for example a user might mark an issue as "Acknowledged" or "Ignored" but later realize there is still an issue in which case they might revert the status. Right now that status is called "New" but the naming could change. It would be good to have a way to preview a page with validation error in AMP mode which would help to debug the issues reported. What is the difference between "Acknowledged" and "Ignored" from a functional perspective? 4b34bdc breaks bulk actions, not only preventing the users from bulk deleting but also from doing any other bulk actions when validation errors still have associated invalid URLs. Acknowledge: Acknowledging an error marks it as read. 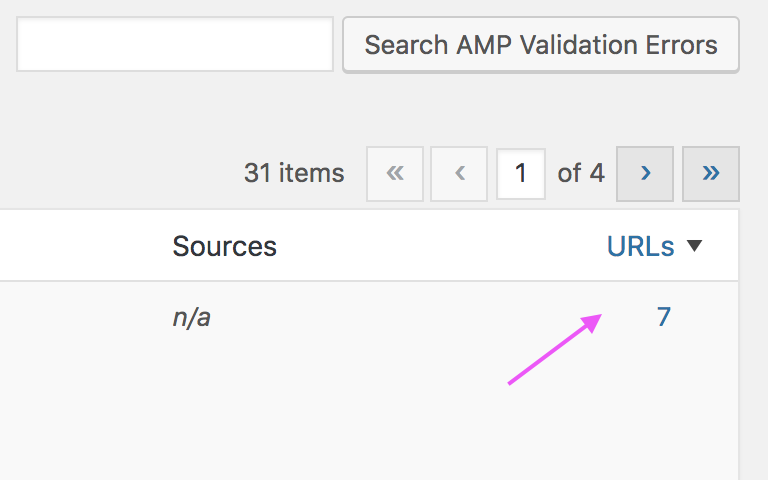 AMP validation errors prevent a URL from being served as AMP. Ignore: Ignoring an error prevents it from blocking a URL from being served as AMP. I'm not totally sold on the naming of “acknowledge” and “ignore” but I couldn't think of anything better. Agreed. I've got this jotted down as a todo item. You're right. Unfortunately WP_Terms_List_Table::column_cb() uses delete_term for whether to show the checkbox. Need to figure out an alternative. Update: Fixed in ac8fd64 (via workaround). @westonruter I took some time today going over the whole validation system, and it's crazy cool! I was initially confused as @ThierryA pointed out, as to the functional differences between Acknowledged and Ignore. 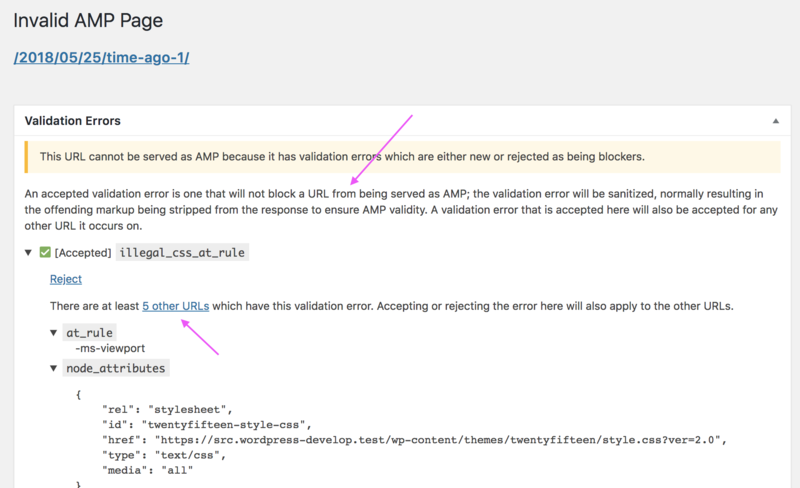 My first thought was ignore tells the AMP plugin to ignore it and leave the invalid markup on the page. Where is Acknowledged meant that you are acknowledging it being removed. Now reading your explanation to @ThierryA's question on functionality, I understand the difference. I still think the confirmation message is a little confusing though. A suggestion on terminology. It seams that Ignore and Acknowledge is similar. Perhaps Dismiss would be better with an option like Dismiss for 1 hour, 1 day, 1 week, indefinitely. Kinda like, saying "ye thanks, I'm still working on it, remind me later." The confirmation messages also made me feel a little confused Ignored 1 error. It will no longer block related URLs from being served as AMP. 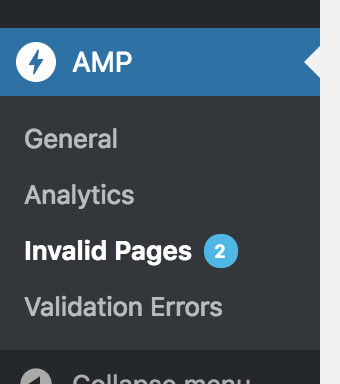 to me this told me that the pages will now be AMP valid. but was confused when I checked the page and it was valid since the invalid markup was being stripped. 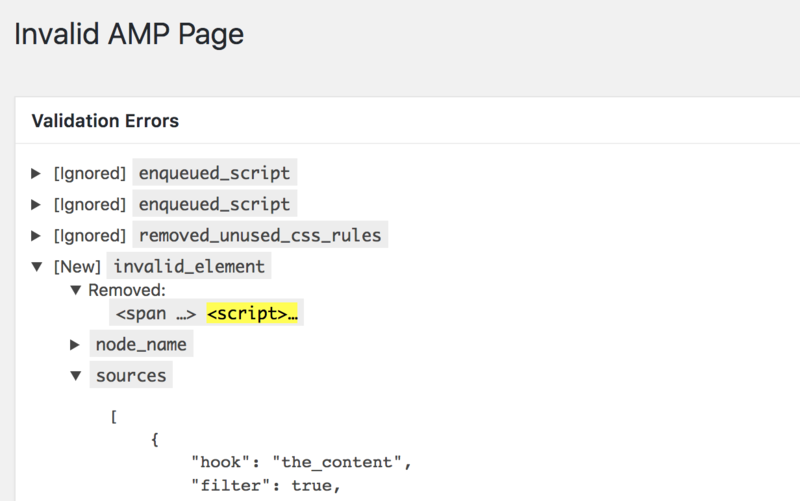 In canonical AMP, whenever $should_remove is false, then this needs to trigger dirty AMP mode, where amp attribute is removed from the html element. 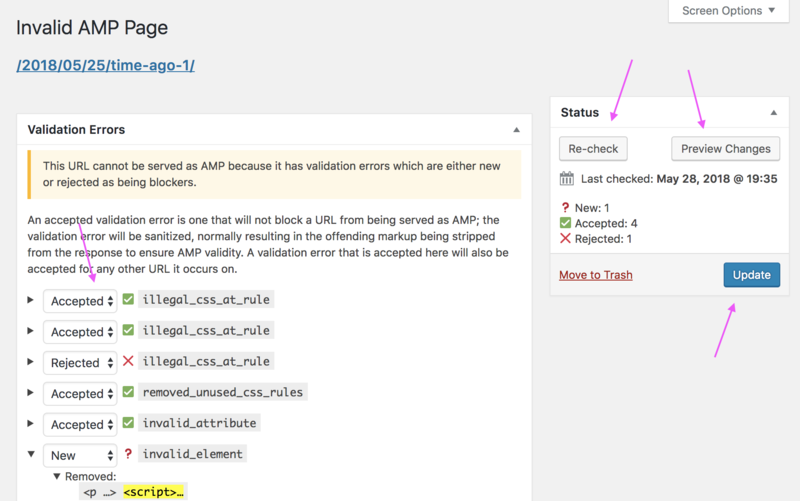 * Add recognition of amp_validation_error_status query var for amp_invalid_url post queries. * Indicate in the list of errors on a given invalid URL post which are new, ignored, or acknowledged. * Introduce amp_preserve_source_comments query param. * Rename locate_sources arg to should_locate_sources. * Remove debug flag for preventing sanitization on all validation errors. * Rename add_validation_hooks method to add_validation_error_sourcing. Allow passing nonce instead of auth cookie to with amp_validate requests. You can see how the URL behaves with any number of validation errors accepted (sanitized). Again, the UI for the invalid URLs screen and validation errors screen needs to be completely redone. The UI code in place now should be considered a prototype. Ideally there would be REST API endpoints added for managing the validation error status and invalid URL posts, and the current screens for managing them should be refactored to use a JS-based interface, such as with React. @ThierryA Given these known issues with the UI and the outstanding need to update unit tests (which will likely change greatly with changes to the UI) I suggest getting this merged sooner rather than later, and then we can follow up with additional PRs to iterate on what is included here. * Use wp_json_encode() instead or serialize(). * Ensure window opened for previewing validation error term status changes to have consistent name. There are a few points, but no blocker from my perspective. It's nice how this is now organized in the includes/validation/ directory. It's nice how using wp_json_encode() removes the need to ignore a phpcs violation. Nice use of number_format_i18(), I didn't know about that. // Guard against Kses from corrupting content by adding post_content after content_save_pre filter applies. It might be good to eventually move these tests to separate files, like test-class-amp-validation-manager.php. It seems there are networking connectivity issues being experienced by GitHub or Travis that are causing jobs to fail. I'm going to go ahead and merge this even though the build isn't finishing.